DVD Review: LETHAL HUNTER Is Mind Blowing Indonesian Exploitation Action! There is a small sector of cult film enthusiast for whom the mononymic director Arizal is a legend. This Indonesian auteur spent the '70s and '80s making some of the craziest low budget action films ever committed to celluloid, and OMG Entertainment (Netherlands) new release of 1989's Lethal Hunter (also commonly known as American Hunter) is further proof that this Arizal is an exploitation legend in desperate need of rediscovery. By the '80s Arizal's star had risen to the point where he could command foreign actors to perform his insane stunts and outrageous action. In the case of Lethal Hunter he roped in low budget superstar Chris Mitchum (son of Robert) along with professional kickboxing legend Bill "Superfoot" Wallace and muscleman Mike Abbott to play out this ridiculous story filled with insane action every five minutes or so. The story, such as it is, involves Lethal Hunter Jack Carver (Mitchum) attempting to recover a microfilm - a stalwart of any espionage film worth its salt - that has the potential to bring western financial markets to their knees. He is pitted against Adam (Wallace) and Frank (Abbott), who are also on the hunt for the microfilm for their own nefarious reasons. Who would think that a tiny little microfilm could possibly have this much impact, but holy crap, people reeeeeeeeeally want it because all hell breaks loose in this cat and mouse game. Cars are driven over, under, and through all manner of buildings, roads, office spaces, and cubicles that they have no business being anywhere near with explosions for days. There are helicopter duels, hospital shootouts, mega-destructive gun battles in hotel lobbies, burly dudes in Speedos, pool parties, kickboxing, people getting caught in nets, backflips, and more, all within a cozy 82 minute run time. It is glorious. OMG Entertainment has teamed with The Gentlemen's Guide to Midnight Cinema podcast for Lethal Hunter, their second release after previous Arizal film Final Score. The DVD is sourced from what is apparently the best materials possible, which are tape based and therefore the results are less than revelatory. Lethal Hunter is presented in a 4:3 aspect ratio, and the image isn't going to blow anyone's mind, but there are some films that demand to be seen in any way possible, and the fact that there is now a legitimate digital home video release of this gem at all is a victory. 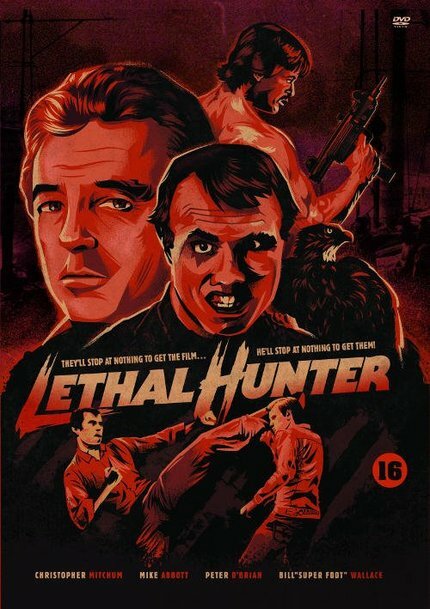 In terms of extras, Lethal Hunter is presented with a feature length conversational commentary from GGTMC hosts William Smith and Rick Peach that captures their unique and engaging rapport and affinity for ridiculous action in a way that makes it almost preferable to the original audio. If you've never listened to the podcast, I strongly recommend giving them a show, and not only because I've been on as a guest a number of times. In addition to the hilarious and entertaining commentary there is also an interview with co-star Mike Abbott about his life and career in Indonesian films and how it changed his life. Also included are newly commissioned artwork and a great overview essay from Zach Kelly. Lethal Hunter is a ton of fun and never boring for an instant. Highly recommended!